It’s no secret that Detroit’s first round draft choice of 2014, Anthony Mantha is having a less-than-spectacular season with the American Hockey League’s Grand Rapids Griffins. While enjoying three super-productive seasons with the Val d’Or Foreurs of the QMJHL, he saw his point total increase from 51 (63 GP) in year one to 89 (67 GP) in year two and 120 (57 GP) in year three. The latter two seasons saw him eclipse the 50-goal plateau in each. So why isn’t all this hype translating to success in his first professional season? Currently, Mantha has just 10 goals and 22 points in 44 games, which leaves a lot to be desired. I observed Mantha in Grand Rapids a week ago, and collected some information about the young sniper. Last summer, Mantha told me that the biggest change he made over the past season was his D-zone, which didn’t particularly show on this occasion. Much like the Alex Ovechkin of old, he spent the majority of the game waiting for his teammates to collect the puck back and feed him a long breakout pass, rather than helping them retrieve it himself. His defensive play was lax, and his physical play only existed during an occasional forward rush. His play was so lackluster that coach Jeff Blashill essentially benched him for the entirety of the second period, as he saw just two shifts in 20 minutes. He still has a lot of adjusting to do, but I’m not suggesting that Mantha is a draft bust; he’ll just require additional time to progress and develop. Is it the style of play in the QMJHL that fails to prepare players (mainly forwards) for the next level? It’s plausible, especially considering the production drop-off of many highly skilled prospects in recent years. Martin Frk, Detroit’s first choice (49th overall) in 2012 scored 113 in 90 games in his draft year and subsequent season. However, in his first year pro he scores just 12 points in 50 games (only 3 goals). He was sent down to the ECHL Toledo Walleye, where his production picked up again. There he scored 13 in 15. This season, he has two points in 15 games with the Griffins, but 35 in 26 games with the Walleye. Another example. Tomas Jurco, Detroit’s first choice (35th overall) in 2011 scored 124 points in 108 games with the Saint John Sea Dogs in his draft year and subsequent season. However, when he arrived in Grand Rapids two years later, he struggled mightily, scoring just 14 goals and 28 points in 74 games. 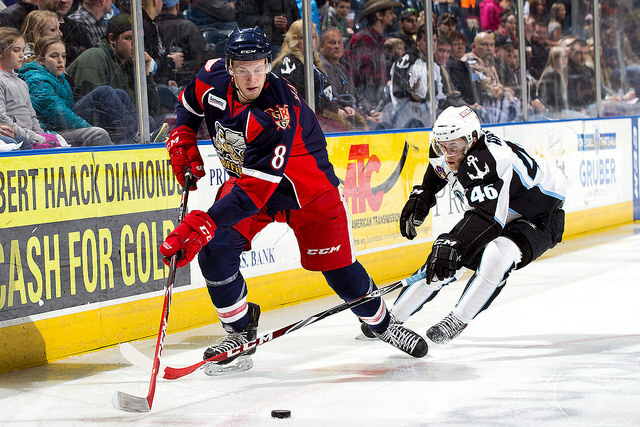 Andrej Nestrasil, Detroit’s third-round pick in 2009, scored 178 points over the course of three seasons in the QMJHL, 174 games. In his first season with the Griffins he scored just 3 goals and 1 assist over 25 games. The year after he scored just 3 goals and 6 points in the same number of games. In both seasons, he spent the majority of his time in the ECHL, where his production rose dramatically to a point-per-game pace. In total, Detroit has had success in drafting forwards from the QMJHL just twice (three only if you count Mathieu Dandenault, who was converted to a defenseman for half of his career), those being Martin Lapointe (10th overall, 1991) and Gerard Gallant (6th overall, 1981). In total, the Wings have drafted 45 players from the Quebec league, with only four (all positions) having proven successful with the inclusion of both Dandenault and Jiri Fischer. I am not including Jurco and Ouellet, whose success in the NHL has not yet been solidified. That is a success rate of only 8.8%. Looking at Detroit’s Ontario League draft picks, we see the names Petr Mrazek (2010), Shawn Matthias (2006), Jakub Kindl (2005), Kyle Quincey (2003), Darren McCarty (1992), Keith Primeau and Jason York (1990), Bob Boughner (1989), Adam Graves (1986), Steve Chiasson (1985), Shawn Burr (1984), Steve Yzerman and Bob Probert (1983), Brad Shaw (1982), Claude Loiselle and Greg Stefan (1981), all of whom have either enjoyed success with or without the Red Wings or are currently enjoying their NHL careers. It isn’t just Detroit that has had such frustration. Tampa Bay’s 3rd overall selection in 2013, Jonathan Drouin, scored 242 points in 128 games with the Halifax Mooseheads. While his teammate Nathan MacKinnon, an anomaly, went on to win the Calder Trophy as the NHL’s top rookie, Drouin failed to crack the big club’s roster, or even AHL Syracuse’s roster, instead being sent back to junior, where he exploded for 108 points in 46 games. This season he has just two goals and 25 points in 52 NHL games. It remains to be seen what will come of Anthony Mantha’s high potential. He will have to develop the professional ideology before he will find success. His transition from junior to pro has been anything but smooth, but it’s not time to write off this talented winger, whose ceiling is still very high.